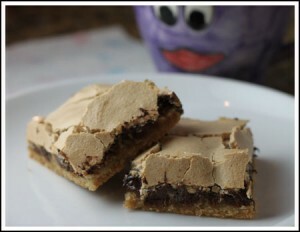 Half-Batch Halfway Cookies are a chocolate chip bar cookie with a light, meringue topping. Preheat oven to 350 degrees F. Line an 8 inch pan with nonstick foil. Cream butter and both sugars. Beat in the egg yolk and vanilla and water; mix well. Combine the next four ingredients (flour, soda, powder and salt); gradually add to creamed mixture. Spread in pan. Sprinkle with chips and pat them lightly into the dough.